Hiding in My Craft Room Challenge #296 April 8th – Super Scraps Saturday “My Besties”! This was scary at first, as I am not the experience Copic artist, but I still love it. I like the sponsor “My Besties”, as they have very details images, and a variety of simple ones. . I like finding the right color palette FIRST. then you can color to match your paper and ribbon/embellishments. If you color first, then I would be scrambling to find the paper, jewels, etc. and before you know it – my craft area is in shambles. Enjoy the challenges, I am brand new to it, but enjoy it so far! And never be afraid to stack 3 or 4 sheets of card stocks. 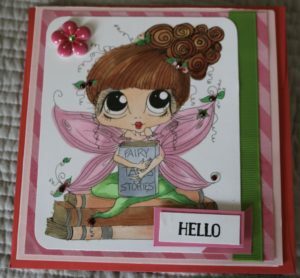 In my “Hello” sentiment, I used the foam popups to give the card more dimension. Have FUN Craken Crafts of any kind! Next Next post: Not Paper Crafting – But Cooking Meals with a Pressure Cooker!